Just moments ago, Marvel Comics Editor in Chief Joe Quesada appeared on The Colbert Report to reveal the identity of the character who will inherit the mantle of Captain America from Steve Rogers, who in the current storyline has been stripped of the Super-Soldier Serum powers that give him his strength and keep him artificially young. His successor? Sam Wilson, the Captain's good friend and sometime sidekick formerly known as The Falcon. 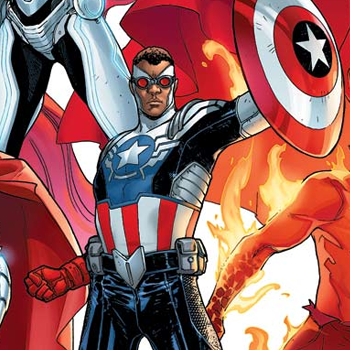 In taking up the shield, Wilson will become the first African-American to be officially recognized as Captain America in the mainstream Marvel 616 Universe; although the similarly-powered (and Super-Soldier Project-related) Isaiah Bradley was referred to as "The Black Captain America" in his day. Though story details are still unfolding, the move seems to indicate a growing trend toward experimenting with race and gender diversity among top heroes of the Marvel Universe: Earlier this week, news broke on The View that The Mighty Thor will become a female character. A few months ago saw the debut of Pakistani-American teen Kamala Khan as the new Ms. Marvel, while in 2011 the Ultimate Universe version of Peter Parker died, prompting Black/Hispanic teenager Miles Morales to become the new Ultimate Spider-Man.